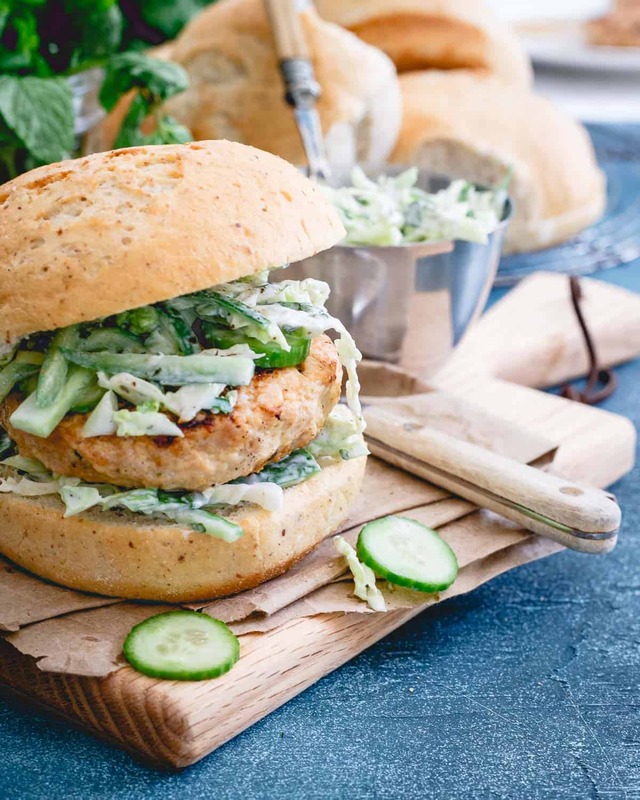 These Indian chicken burgers are topped with a refreshing yogurt cucumber slaw. Perfect beef alternative to throw on the grill for a moist, flavorful burger. There are two food “groups” I guess we’ll call them that I immediately regret cooking the second they hit the pan on my stove: any fish and pretty much all Indian dishes. Maybe I’ll change my tune if we ever renovate the kitchen and I actually get a hood vent above my stove but right now the over the stove microwave (that isn’t even vented to the outside) does absolute jack you-know-what to take the smell out while cooking. There’s nothing worse than walking into your house the next day and smelling yesterday’s fish or curry lingering in the air. 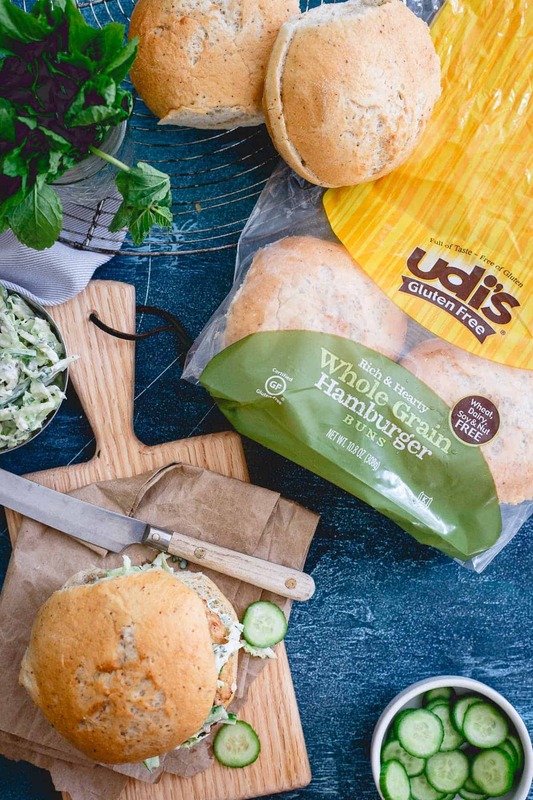 *This recipe for Indian Chicken Burgers is sponsored by partner, Udi’s Gluten Free. The thing is, I love both fish and Indian, especially this Indian chicken recipe and I refuse to stop cooking either one. On the fish front, my solution is usually roasting (like with this tart cherry glazed salmon) – the inside of the oven tends to do a much better job keeping that stench contained than pan frying. On the Indian food front, however, it’s a little more complicated. Hard to make a curry like this red shrimp curry in the oven and while the slow cooker is definitely an option for some dishes, it’s not a universal solution. When the idea for these Indian chicken burgers came about, I was stoked I’d get that delicious Indian/curry flavor I was craving but none of the clinging day old curry stale air slapping me in the face every time I walked into my house. Chicken is such a great alternative to beef when it comes to burgers. I actually like them better than turkey burgers because I think they tend to come out more moist and juicy. 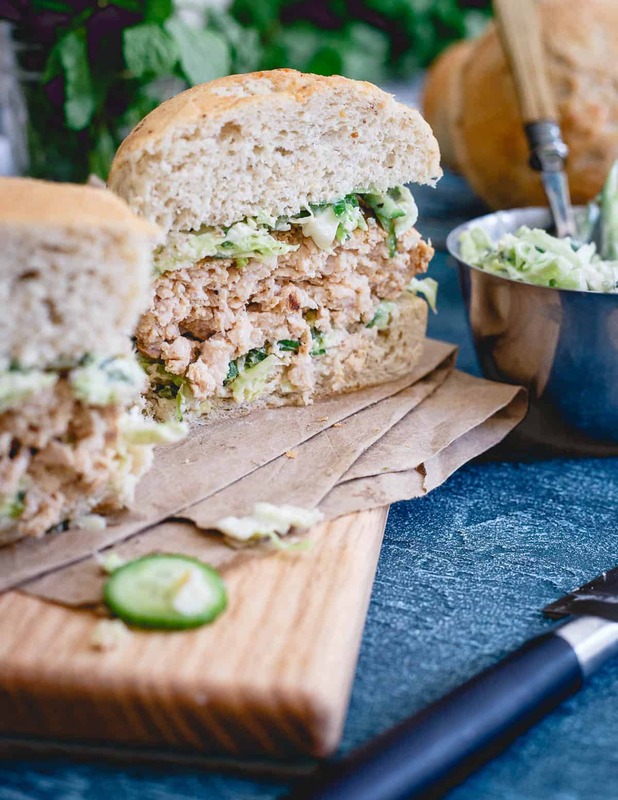 These Indian chicken burgers are made with a bit of Greek yogurt too which definitely helps too. The burgers are bursting with savory Indian flavors and balanced perfectly with the refreshing yogurt cucumber slaw on top. You get a savory, spice filled bite of the burger with a bit of cooling, lemon, yogurt, cucumber and cabbage slaw and it just makes your mouth happy. I used gluten-free bread crumbs and my favorite Udi’s Gluten Free Whole Grain Hamburger Buns to make these burgers friendly for any cookout and my husband, the weirdo that usually just eats meat on a plate sans any sort of bun, liked them so much he ate the rest of the buns as his “bread” in the morning with his usual egg and sausage scramble. I married a freak that doesn’t like chocolate and has basically zero affinity for bread-like carbs (he’s gotta be an alien life-form, right?) and somehow these gluten-free hamburger buns are the thing he breaks from his weird mold to eat, if that tells you anything about how good they are. I have a thing about buns with my burger – they can’t be too much bread but they also can’t be too little. It’s basically a goldilocks situation and they need to be juuuuust right, that perfect balance between doughy goodness but not so much that they overtake the burger because, let’s be real, the meat is always the star of the show. These Udi’s buns do that perfectly. 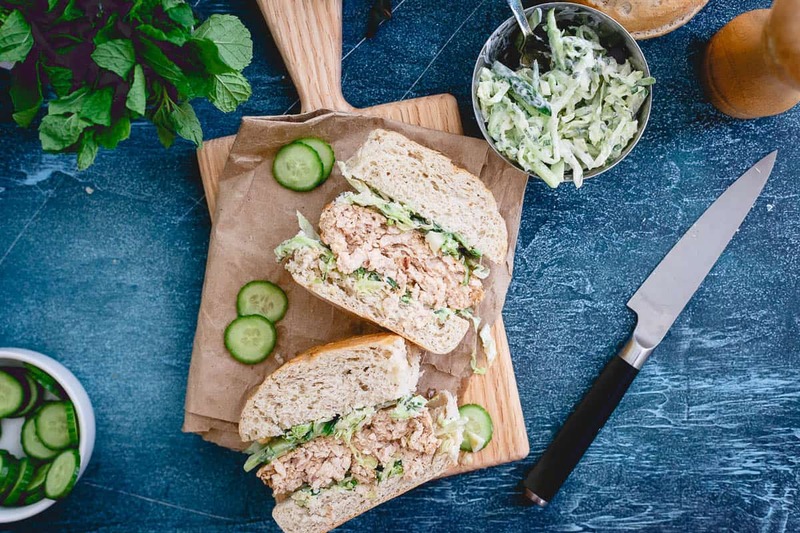 Every bite is the perfect amount of delicious carb to Indian chicken burger ratio and with everything cooked out on the grill, you can wake up the next day without that nauseating day old food smell lingering about. If you love Indian flavors, don’t miss these Indian steak kebabs and make sure to check out this Thai chicken recipe recipe too because the flavor profiles are quite similar between Thai and Indian. Looking for more recipes like Indian chicken burgers? 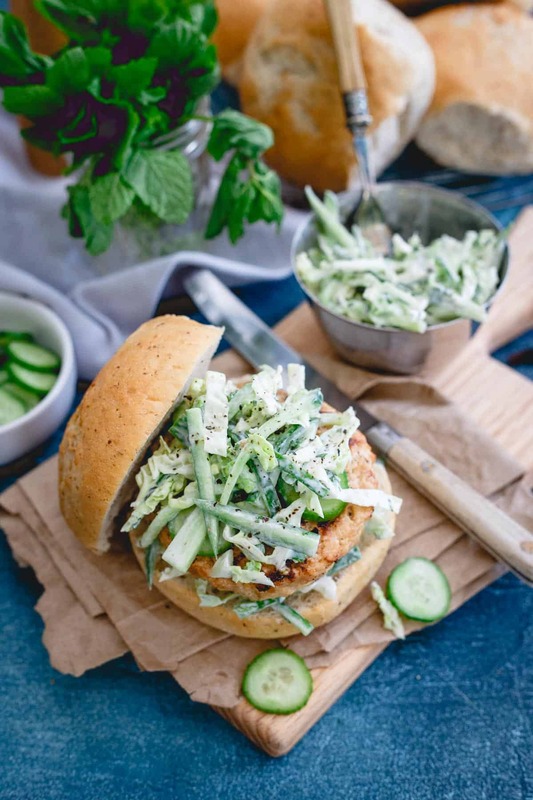 These Indian chicken burgers are topped with a refreshing yogurt cucumber slaw. Perfect beef alternative to throw on the grill. Combine all the ingredients in a large bowl. Mix together until well combined and form into 4 equal sized patties. Cover and refrigerate until ready to grill. Cook burgers on an outdoor grill (chicken burgers are a bit looser than beef, if you have a grill mat, place the burgers on that to grill as they won't be as prone to sticking) or indoor grill pan until cooked through. Place each cooked burger on a bun and top with slaw. Place all ingredients in a small bowl and mix until well combined. I could eat Indian food for EVERY single meal! So, these are defs on the menu this week! I’m making Indian spiced chicken today but now I wish i was making burgers! I’m seriously digging the flavors in this recipe. That slaw, though! I am loving the flavors here. Pile on the slaw, please!! Gina- these look so delicious. I’m on board with curry anything, but it’s that slaw that has got me all gaga eyed! PS UDI’s buns for the win! We always have a package in the freezer. This sounds fantastic! I love that slaw on top. This looks delicious, adding to my meal plan for September. Wow, I love Indian food, this is a brilliant idea, great job!